Pete Seeger, one of the biggest legends in the history of folk music, died last night at the age of 94. So I thought I'd take a moment to write a brief post about a couple of his connections to our city. Once upon a time, Pete Seeger used to visit Camp Naivelt in Brampton just outside Toronto. It first opened in 1925 as a camp for young socialist Jewish kids — nearly 100 years later, it's still dedicated to that very same purpose. During the upheavals of the 1950s and '60s, Naivelt was a strong supporter of the peace movement, along with labour rights and social justice. That helped to make it a magnet for folk musicians. Some of the biggest names in folk music came to play songs for the kids who spent their summers there. Meanwhile, the anti-Communist RCMP would hang out at the front gate, taking down license plate numbers. Phil Ochs (who wrote the famous protest song "I Ain't Marching Anymore") came to play at Camp Naivelt. So did Paul Robeson (who sang the seminal version of "Ol' Man River" in Show Boat — before he was blacklisted and targeted by Joseph McCarthy's House Committee on Un-American Activities). But the most famous visitor of all was Pete Seeger. Seeger, who made a special effort to play at children's camps, was a frequent visitor to Naivelt. He stayed for days at time over a period that lasted all the way from the 1940s to the '80s. Even as recently as 2008, he said that he remembered Camp Naivelt fondly. "A wonderful place," he called it. By playing his songs there, he helped to inspire generations of Torontonian kids to become folk musicians. The children who went to Camp Naivelt have gone on to become some of the greatest Canadian musicians of all-time: they include people like Zal Yanovsky of The Lovin' Spoonful, Yorkville folk star Bonnie Dobson, The Travellers (who wrote the Canadian version of "This Land Is Your Land"), one of the founders of the Mariposa Folk Festival, even the guy who wrote "Hit Me With Your Best Shot" for Pat Benatar and Sharon Hampson from Sharon, Lois & Bram. She tells a story about watching Seeger sing a chain-gang song at Camp Naivelt while he chopped wood, swinging his axe as percussion. Seeger had an unfathomably deep impact on the history of music everywhere — but he had a particularly powerful influence on the history of music in Toronto. "[Seton] boosted the idea of learning about the North American Indians. I learned that they shared everything that they had... There was no such thing as one person in the tribe going hungry and others having full bellies... That seemed to me to be a sensible way to live. Now today I know that anthropologists call that tribal communism. So I say that I was a Communist ever since I was age seven, when I first started reading about Seton." 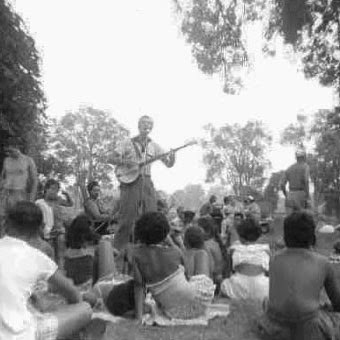 Photo: Pete Seeger at Camp Niavelt (via a Brampton Draft Heritage Report, PDF here, credited to Barbara Blaser). This post originally appeared on the Toronto Dreams Project Historical Ephemera Blog. You can find more sources, links and other information here.